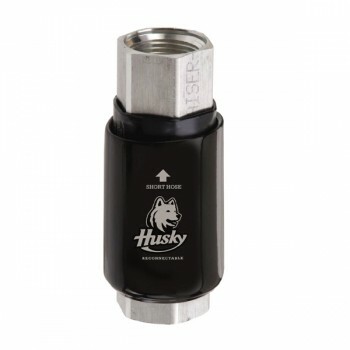 All Husky® Safe-T-Breaks® stop the flow of fuel on both sides of the separation and have passed the demanding UL test requirements on separations without leaking or failing. • Retains UL listing after reconnection. • Internal pressure balancing chamber prevents “line shock” nuisance separations. • Separates at less than 200 lbf / 899.6 N which minimises “backlash” force of separation reducing damage to equipment. • Uses the same internal balancing chamber as Model 002276. • Separates at less than 115 lbf / 511.5 N.
• Light weight, inexpensive and disposable. • Same instant-closing dual poppet check valve design as Model 002276. • Separates at less than 300 lbf / 1334.4 N.
• Internal Pressure Compensation Chamber (PCC) that prevents “line shock” nuisance separations. • Separates at less than 225 lbf / 1000.8 N.